Apart from being versatile, potatoes offer a great base ingredient on which to build tasty snacks and light meals. The following serving suggestions, that incorporate eggs and cheese, make a change from serving plain boiled or mashed potatoes. When they are prepared as in the first recipe, these potato cheese eggs are just as good served cold as part of a buffet, too. Both of these dishes are a little bit different-cheap and filling, but simple to put together. Adapt them to suit your taste and pocket. For example, by substituting cheddar with a different type of cheese-try something like Cotswold with herbs-or some finely grated onion mixed with a teaspoonful of curry powder. This simple dish can be transformed from basic snack to speciality.Potatoes, eggs and cheese are often overlooked as potential meal-makers; yet dishes like these can bring new flavours, textures and combinations to your plate and complement so many other things. The use of goat cheese, blue cheese, a shake of paprika (and a little loosening of your adventurous spirit) will help to relieve the monotony of how to serve the spuds! Mix the mashed potatoes with the butter, grated cheese, chives (or onion stalks) then, season with a shake of sea salt and ground pepper. Beat the mixture until smooth. Shake some flour onto a board, or work top, and into your hands. Divide the potato mixture into 4 equal sized portions. Place a hard-boiled egg in the middle of each potato portion and mould the potato mixture to cover the egg. It doesn’t have to be smooth, but try to make sure the whole egg is completely covered by potato.Brush the cheesy potato and egg ‘balls’ with beaten egg, then, roll them in the breadcrumbs.Chill them for about half an hour. Deep fry the potato eggs in hot fat until they look crisp and golden. Alternatively, bake in a preheated oven (180C) for 20-30 minutes.Serve the potato eggs hot with your favourite barbeque sauce on their own as a light tea, or with poached haddock/smoked ham and a side salad as a hassle-free main course. This is another variation that takes less preparation because it uses whole potatoes, rather than mashed. 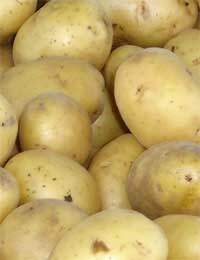 Maris Piper potatoes are consistently good for cooking in the microwave-aim to use potatoes that weigh 175g-225g. Preheat oven to 180C.Wash and dry the potatoes. Then, prick them all over with a fork, cook in the microwave according to your cooker’s instructions.When cooked, remove the potatoes from your microwave and slice the top off each one-these tops will be used as lids later so don’t make them too flimsy. Use a metal spoon to scoop out the potato flesh from each baked potato. Set aside the potato ‘shells.’Mix the cream or crème fraiche with chopped dill, chives, parsley or salad onion, season with salt and pepper.Add the scooped out potato flesh to the cream/herb mixture and combine the ingredients well.Now comes the messy bit! Fill each potato shell with the mixture, but leave a dip in the centre.Break an egg into the dip. Sprinkle grated cheese on top of each egg.Bake the stuffed potatoes in the preheated oven for 15 minutes. Bake the potato lids for the last 5 minutes to warm them through and encourage them to crisp up. Remove from the oven and pop the lids on your potatoes. Serve the potatoes immediately-either on their own as a tasty tea dish-or as an accompaniment to make a substantial meal.